Now that we are a little settled in our Chelsea, Michigan home, I'm so excited to start taking Michigan maternity photography sessions. Vanessa reached out about a water session during her pregnancy for twins! We scheduled a time for the photoshoot, but the babies had other plans. Instead of shooting outside in the lake as we had hoped, instead most of the session took place in their lovely home. 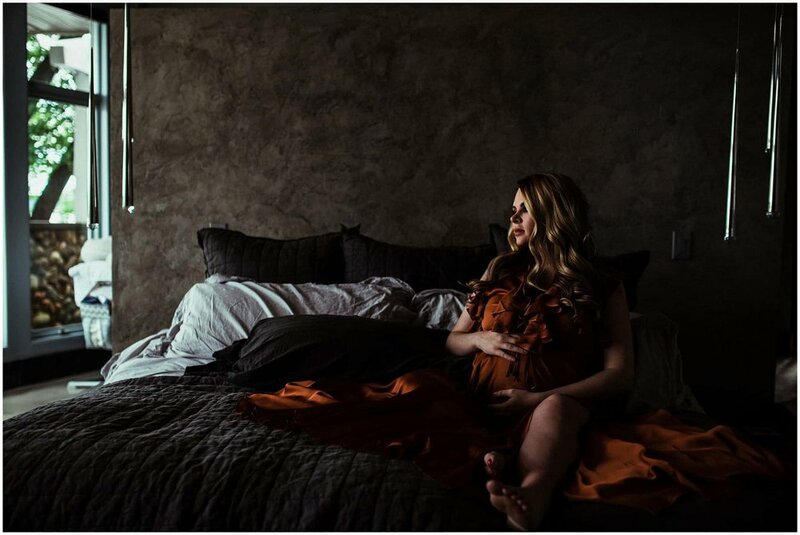 The light filled space was perfect to capture her final days of pregnancy. We spent time creating art in the home that she created for her family. As we took photos, we talked about all things pregnancy and birth. I love the photos that we captured as she focused inward on those babies and the love she has for them already. Aren't women amazing? I mean, we grow and create LIFE. Then, after life is here, we nourish our babies from our own bodies. The selflessness in that act is one that we should always honor. I mean we should really HONOR that. It's hard to grow a baby and she's growing two of them. You are amazing. Here are just a few of my favorite photos from Vanessa's session and stay tuned for the photos of the TWINS on the outside. Michigan Maternity photography - Authentic, documentary, free spirited. Are you ready to schedule your Michigan maternity photography session? Email me today!